This project focused on bridging institutions to advance clinical and community-engaged collaboration, education and research. Joan acted as chief facilitator and liaison to build a new partnership between MeHarry College and Vanderbilt University, to also include Metropolitan General Hospital. The main focus was on enabling the partners to work effectively together, to resolve issues and generate productive ideas. The mission was to coordinate a major medical initiative, creating a collaborative partnership that would result in a highly profitable medical research program between a consortium of universities, hospitals and government agencies. The target demographic were poor, under-served populations. Provided ongoing consulting and facilitation to Vanderbilt on two initiatives. The first was focused on setting up and tracking the implementation of a diversity initiative at the VU Medical College (VUMC). This involved benchmarking what other academic medical colleges of equal prominence have been doing, and leading the Cultural Diversity Steering Committee. The second project centered around assisting in the implementation of a formal alliance that has developed between VUMC, Meharry College and Metropolitan General Hospital, focusing on the integration of the various cultures, both organizational and ethnic. Facilitation: Joan oversaw communications between VUMC and MeHarry and VUMC and Metropolitan General Hospital in forming an extraordinary pioneering alliance. Discussions were focused on bridging racial and cultural gaps between organizations with little understanding of each other or of ways to communicate and build trust and collaboration. She acted as the facilitator at each location as well as for all cross-functional meetings, overseeing the implementation of the complete project. One challenge was to integrate the diverse cultural, ethnic and organizational environments associated with a white university and a historically black medical university in order to achieve a viable and valuable partnership. 1) She set up and tracked implementation of the diversity initiative and led the Cultural Diversity Steering Committee. 2) She assisted in the implementation of a formal alliance developed between VUMC, MeHarry College, and Metropolitan General Hospital, focusing on the integration of cultures, both organizational and ethnic. 3) Early on, the scope broadened revealing the need for additional best practices research and assessment in diversity alliances in universities, a project that Joan developed and oversaw. She also reported back the results so that the Alliance committee could make the best decisions possible on how to work together. The Alliance has become highly successful in leading and advancing inter-institutional efforts and it garnered $340 million+ in grants to date. All organizations involved have grown in size and reputation. Many sub-alliances have developed and research for minority cultures has increased. The focus continues to be on medical issues for under-served populations and the initiatives continue to expand since Joan initially set up the structure. For example, the Diabetes Improvement Project at MeHarry-Vanderbilt has been running since 2010. It consists of a consortium of hospitals and universities (including all those in the M-V partnership) across middle Tennessee with 7 systems serving over 106,000 uninsured or poorly insured people. Objective: The airline industry was tasked by the Department of Transportation to develop a Code of Customer Service in 2000 due to the rising customer complaints and increasing safety concerns. In order to be compliant with the new FAA/DOT requirements and to rebuild their organization to be more effective, Dr. Pastor worked with the leadership of this airline to create a comprehensive report and to provide actionable feedback. The ultimate goal was to create a common organizational vision and to outline the steps ahead that were required to support change and achieve compliance. In the process, it was ultimately necessary to rebuild the business infrastructure to achieve the goals. *Due to the highly sensitive nature of this project, the name of the airline is withheld to protect the confidentiality of the client. Joan worked with this airline to assess several of their core processes using employee and management facilitated workshops, interviews, on-site observations and audits. The airline had recently suffered a series of flight delays as well as a devastating plane crash, so it was clear that they needed to assess the current processes and create new methods of operation, addressing customer service, safety and reputation issues. Focus groups were used to gather and share information in the initial stages of this project. Focus groups were set up, consisting of decision-makers and directors in all major areas of operations, including customer service, mechanical maintenance, air traffic controllers and communication/signage. In an attempt to build trust and encourage collaboration, focus group participants were encouraged to share their perspectives, including their understanding of the current processes, the nature of their team’s roles and functions, obstacles to their performance and recommendations for process improvements. Focus group participants were asked to jointly discuss the strategic environment, including their understanding of a common organizational vision. Subsequently, they discussed the progress their teams were making toward the achievement of these goals and they were also asked to identify the existing gaps. Next, individual follow-up meetings were conducted to further explore some of the priority issues, opportunities and challenges that were raised in the focus groups. The discovery and analytical process was structured in specific steps. Outline the goal or vision for each team and for the larger organization. Conduct an assessment to guide the creation and implementation of a new plan, to achieve measurable results. As a result of the information and insights gained during the meetings, interviews, exercises and assessments, Dr. Pastor was able to resolve core ongoing problems and implement needed changes in the management and organizational structure. Although the group was initially reluctant to discuss their challenges, as the teams mistrusted each other, Dr. Pastor was able to eventually encourage the employees to open up and communicated. As a result, the group began to work together. According to the employees, much of the mistrust was generated by the existence of an organizational “cowboy culture”. It was discovered that there was a need to build awareness and increase communication between teams, as teams were often unaware of the specific functions performed or challenges faced by their counterparts. When Dr. Pastor introduced the teams to the nature of each other’s roles and job functions, they became more comfortable in working with other teams and formulating joint processes to address customer service and mechanical/safety problems. Dr. Pastor led the groups in an effort to document the existing processes, in order to recommend changes to increase efficiency and effectiveness. She discovered that there were no clear processes in place to guide their resolution of flight delays and other customer service issues. It was customary that each team and each individual handled the scenarios differently. Working with the focus groups and the leaders, she helped to develop a plan to insure and guide organizational growth. This resulted in a rebuilding of the business infrastructure. Since the performance appraisal system was also identified during the interviews as a key factor in driving critical employee mistakes, Dr. Pastor reviewed and modified the current system. She created a plan and recommended implementation of a new performance appraisal metrics that solved this problem. The new metrics eliminated incentives to take short-cuts in order to meet their own, or their supervisor’s, performance goals. A major corporate restructuring and complete process re-engineering was mapped out for the leaders and decision-makers. Dr. Pastor ultimately provided an extensive report and valuable feedback to the airline leadership. She recommended ways to improve the processes, based upon feedback gathered from the focus groups, assessments and individual interviews. The focus groups highlighted key areas that required attention and improvement, including collaboration, communication, trust and performance metrics. It was clear that the airline needed a plan in place to insure and guide their growth. 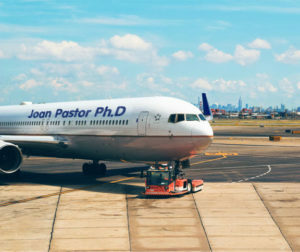 Ultimately, Dr. Pastor’s report provided the airline with a comprehensive plan to achieve compliance with Department of Transportation requirements. The final report detailed actionable plans for rebuilding the business infrastructure. It outlined steps to collaborate, communicate, assess and to improve overall organizational performance. Dr. Pastor outlined a viable and compliant strategy to effectively and efficiently address key customer service issues and to reduce safety concerns for this airline. The resultant processes supported this goal by providing improved methods to communicate plane delays, streamline boarding processes and minimize safety challenges. Dr. Pastor worked closely with the managing partners of a major U.S. sportswear company to develop and implement a team-based organizational culture throughout many departments in their organization. Dr. Pastor was originally contacted to provide training for the customer service department, with the goal of resolving conflicts within this group. She led a two-day training program focused on developing a process for building high-performing, collaborative teams. It was quickly noted that there were also some visible internal tensions between Human Resources and other departments. Consequently, the training was initially focused on the development of a structure and process to transform one group, but was quickly expanded to include half of the organization. Extensive training, strategic planning, executive coaching, competencies development and other key consulting services were provided to assist the company in their organizational change efforts. Dr. Pastor coordinated her efforts with an associated company-wide upgrade in technology, including all computer and telephone systems. As a first step, Dr. Pastor worked with the executive team to determine their vision and define the strategic objectives of organization as a whole, as well as the expected contributions of specific teams. Next, she tasked each department to develop their own specific vision, in alignment with the larger organizational objectives. This vision included their anticipated contributions and metrics for measurement. Departments were asked to determine how they would communicate and interact with each other as well as how they would develop essential skills. Popular Team Support Agreements were developed, outlining how teams would interact with each other. The Agreements included standards for behavior and processes to make certain communications are heard and colleagues demonstrate respect for each other. As a result, the Agreements helped to resolve conflicts and establish new guidelines for future interactions. The departments were also directed to generate their own critical success factors and to determine how to most effectively implement their vision. They identified standards of operation and they prioritized the areas of team focus, all leading to the accomplishment of their goals and the attainment of their vision. Most business functions chose to supplement their evolutionary process with additional skills training, including stress management and personal development. Politics was one key challenge to overcome in moving forward with a comprehensive strategy that involved the entire organization. The CEO was monitored by the family owners in China and he acted as essentially a figurehead. There were two sides to the organization and differing leadership perspectives on each side. The creative side, which included all functions related to clients, was led by the CEO. The side which included all internal, support functions was led by the COO. Dr. Pastor worked with both sides to develop new operational strategies and business processes. However, the CEO and the COO did not get along very well and did not have the same vision for the organization. The goal of the COO was to grow the company and change the culture, while the CEO was not entirely supportive of this effort. It was difficult to achieve a cultural shift, as the idea for change was not generated by the leadership. Unfortunately, the process did not ultimately achieve the buy-in and support of the leadership, as they were reluctant to relinquish control of the company culture and strategies. This type of change was not intuitive to the Chinese family as they wanted to retain the ultimate decision-making and leadership position, so they would not endorse the efforts of the COO to widely implement change. As a result of pressure from the Chinese family, the CEO was not supportive of implementing the process on his merchandising side of the organization. Although Dr. Pastor engaged the leadership in the re-engineering of a business process, it became very apparent that cross-cultural differences were creating obstacles to progress. The Chinese family of owners placed a representative in the executive training group as essentially a “babysitter”. The inclusion of this family representative created a formal and intimidating training atmosphere. When the process was implemented, it also became clear that some employees did not feel comfortable in a collaborative environment, as they previously worked for decades in a competitive structure and they continued to embrace inter-company competition and preferred to work in a political environment. In the conduct of the training sessions and employee interviews, Dr. Pastor detected another problem. Employees were not keeping up with advances in technology. Some functions were struggling – including Human Resources and Information Technology. It became very difficult to introduce and implement new IT systems, with a high turnover in IT Directors. Members of the executive team as well as teams in the individual departments were taught a step-by-step process to help them perform collaboratively to achieve department and organizational goals. Dr. Pastor also trained them to resolve conflicts – so that the conflicts do not become challenges, and impede progress. In the end, everyone was operating with the same rules. The communication and implementation of organizational changes prompted employees to make a decision – they recognized the need to either “get on board or jump ship”. After fully understanding the new directions and goals of their leaders, many remained but some chose to leave or were asked to leave. It was important to share the same team objectives of embracing collaboration, adding value to the organization and working to drive performance. “Without judgement or blame” – some employees simply maintained a reluctance to change or learn new skills for their jobs. Simultaneously working with the IT department to assist with their transformation, Dr. Pastor led them in the establishment of performance goals, including the financial goal of controlling costs. Noting that, “if there is conflict, there will not be accomplishments,” she also trained the IT department to overcome conflict and taught them valuable negotiation skills. Dr. Pastor also provided additional training for the Customer Service function. Conflict management training was a valuable skill in the customer service representative’s role, particularly in their interactions with dissatisfied and complaining customers. She identified key measurable factors for the performance of customer service representatives- the ability to satisfy the customer complaints and the retention of customers with complaints. She also incorporated customer satisfaction surveys into their service function, providing ongoing feedback to fuel continuous improvements. In addition, Dr. Pastor strengthened the partnership between the Customer Service and Sales Departments, making the interaction between each sales person and their” partner” in Customer Service very critical. The departments learned specific partnership skills that were related to high performing team training (HPT). The goal was to develop a strong triangle or family relationship between customer, sales agent and customer service representative. The sales representative pursued business objectives by obtaining the client. When concerns, problems or questions arose and the sales agent was not available, the client could regularly rely upon the same Customer Service representative to assist them. Working with the Human Resources department, Dr. Pastor developed measures to solve their problems. A key measurable was to limit HR’s role in management and evaluation of employees by comprehensively training managers to effectively provide their own constructive or negative feedback. The role of HR was limited to support in the room of the feedback only in severe cases that required a witness. Previously, the managers did not like to provide constructive feedback and they relied upon the HR department to take on this role. 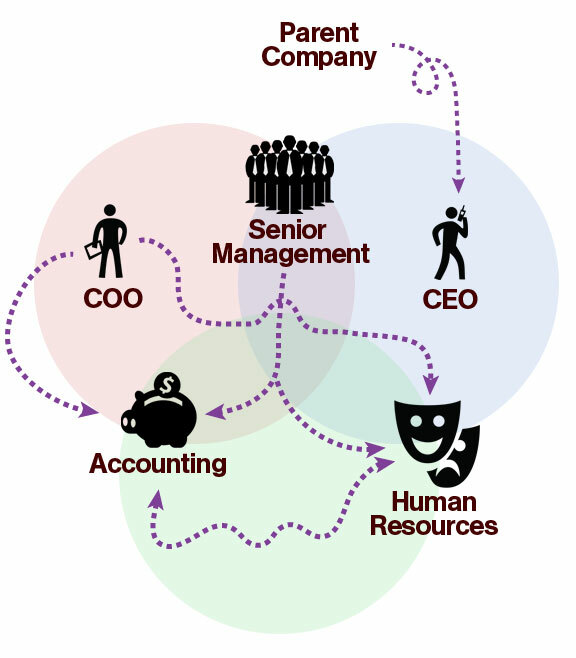 Unfortunately, the Human Resources department developed a reputation as an extension and puppet of the management, elevating them in the estimation of management, but creating tension with other departments. Since this was a significant change, several members of the HR team were resistant to the new roles – some departed the company and some were asked to leave. Eventually, a supportive team developed in HR and the director became very involved in managing the change and organizational development initiatives. She became an asset to the COO in his efforts to promote the changes. Measurable results were achieved by the individual teams. One example is the Accounting Team. The Controller, worked for the COO on the internal support function side of the organization. This team embraced the training and appreciated the opportunity to improve. They created charts to demonstrate their personalities and discussed how they might work better together. The team discussed the dynamics of relationships and motivations, they enthusiastically posted their key department visions and they also engaged in quarterly meetings to determine their progress and revisit the agreements they made with each other. The team diligently used the comprehensive binders, filled with materials that Dr. Pastor developed, to guide their implementation of the change strategies. · As a result of the organizational change process the internal support function side implemented performance metrics with all teams that went through training. This was extremely useful in measuring their progress. · The internal support function side began to operate at a higher level and regularly used performance to identify new opportunities and advancements in the organization. · This team was operating at much higher levels, measuring retention and defining career paths. · The Accounting Team used the process to define how they could improve and become more engaged. · As the Controller implemented the changes, her team became more goal and results-oriented. · One revelation was that the COO demonstrated to the internal support function side of the organization that he was protecting them and had their best interests in mind. He changed his management style and learned to work effectively with his own executive team. Unfortunately, after the organizational change process was completed and implemented, there was a demonstrated imbalance in the company performance. Significant change had been implemented successfully within one side of the organization. Consequently, the two sides of the organization were not operating on the same level. One embraced the new process, while one did not – one was improving, while one remained stagnant. One side was healthy – one was not.